Origin: This subspecies of the common box turtle is native to the south-central region of the United States. It usually has just three toes on the rear feet. 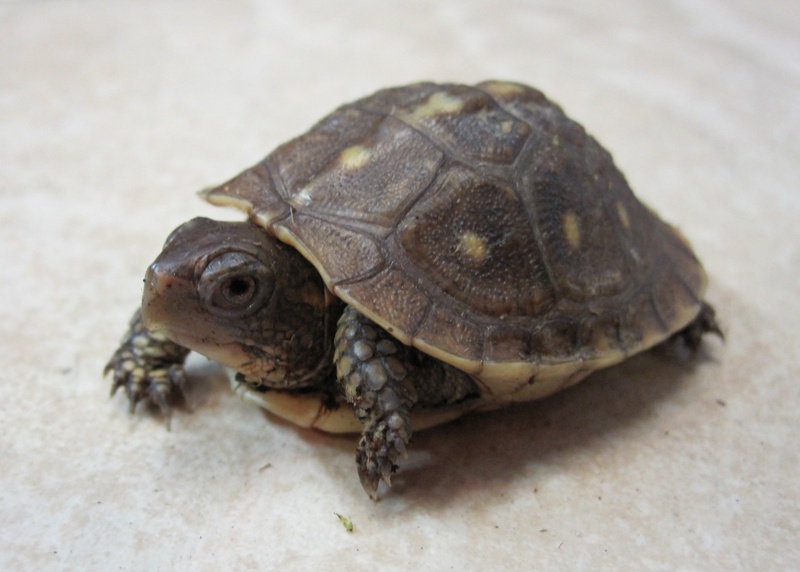 Other box turtles have four. You will find many ways on the internet on "how to" take care of this animal. This care sheet is showing the way we found works best for us from our many years of experience of caring for this species. In the wild, the Box Turtle rate of reproduction is not high. As a result, the collecting of them from their natural habitat could be damaging to the population. Only purchase captive-bred turtles and from reputable reptile stores or breeders. The Three Toed Box Turtle lives in a diversity of habitats from meadows to forests. However, they are usually not far from water. In captivity, large secure outdoor enclosures are ideal if you live in a favorable climate. They like to move around. For adults kept indoors, the larger the enclosure the better, a minimum size of 2" x 4". But it is important to let your turtle out to explore in your home. They don't like being cooped up. Because Three Toed Box Turtles turtle will want to burrow, you should line the enclosure with a good loose substrate mixture of 2 parts Zoo Med eco earth and 1 part Exo Terra natural sand, at least 4" to 5" deep or deeper for adults. Keep it clean by spot cleaning whenever they go to the bathroom. Provide a hide, plants, and other cover. Slabs of bark, hollow logs, or the like for them to take shelter in. You'll want to keep your enclosures ambient temperature around 75 degrees with night time temperature drop only down to 70 degrees. A basking spot of 85-90 degrees should also be provided at one end of the enclosure. Use a good quality temperature gauge, like Zoo Meds digital temp gauge or Exo Terras Thermometer to figure out the temperatures in your enclosure. They will need a UVB light to help properly process calcium and to synthesize vitamin D3. Since they are not out in natural sunlight in our homes, we must provide UVB light in the form of a special fluorescent bulb designed to produce UVB rays. The best bulbs are the mercury vapors such as Exo Terra's Solar Glo bulbs, ZooMed's Powersun, or Solar bright bulbs. These bulbs provide heat and UVB all in one bulb. You can also use separate basking (heat) bulb and UVB bulbs. If you use these, you will want the Zoo Med 5.0 or Exo Terra UVB 100 variety. Moisture is vital to Three Toed Box Turtles. They can become sick if it's too dry in their enclosure. They also do like to soak and swim, so provide a sturdy water tray that they can get in and out of easily. They often drink and defecate at the same time, so it's really important to change the water daily. Shallow Exo Terra bowls or the Zoo Med repti ramp both work well. In addition, mist your turtles enclosure every day to keep the substrate damp. You will want to soak babies in a shallow bowl of room temperature water every morning for approx. 15 mins. to help them stay hydrated. Box Turtles are omnivores and require a balanced diet. They do eat some plants--broadleaf weeds and a variety of dark leafy greens. The occasional fruits and vegetables too. They love earthworms, mealworms, hornworms, waxworms, and crickets. You can top off your greens with Repashy bluey buffet or zilla dried vegetable mix. Make sure to coat your turtle's worms with calcium (with D3) and the greens with calcium and vitamins mix such as Repashy Superveggie. Three Toed Box Turtles are gentle and friendly. Unlike some other turtles, they do not bite. This solitary species is most comfortable if housed individually. They are fun to watch, though it can be stressful for them if handled too much. After they get to know you they will follow you around, liking to be near to you, though they would still prefer not to be picked up or handled too much.